The driver and his passenger were critically wounded when the gunmen opened fire on the vehicle, which was transporting gold. Two people were injured and their motor vehicle was left riddled with bullet holes after an attempted robbery on the R21 near Emperors Palace, reports the Boksburg Advertiser. 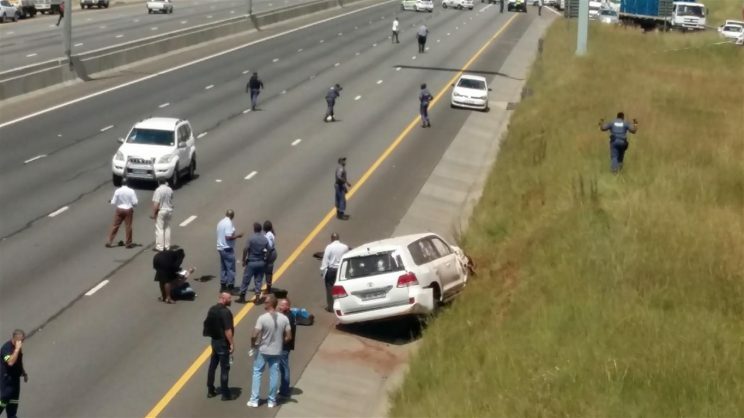 According to the Boksburg North SAPS spokesperson Constable Justice Ramaube, a gang of robbers started shooting at the victims’ vehicle as it was travelling along the R21 towards Kempton Park. “The driver apparently subsequently lost control of the vehicle after he and his passengers suffered gunshot wounds in the shooting. Officers found a small box containing gold in the victims’ vehicle,” said Ramaube.